This is a guest post by Ashwin Sharma who is an avid traveller. Ladakh or popularly known as Leh Ladakh – A dream destination. It was planned and cancelled in 2010, planned again in 2011 to be cancelled once again. And as always the best trips are those which are planned at the spur of the moment without any plan. It finally happened this year. After getting reprimanded in the office on Friday sitting with a beer in my hand with 2 friends near a deserted lake at 3 in the night, a friend says lets go somewhere. I was not in a mood to go to office and wanted to go somewhere, desperately. And within minutes it was decided we all are taking a week off from our respective offices. With Internet it is difficult to expect surprises and get an expression of an awe and there is exhausting detail about every possible thing and place, so we decided it was better to keep our knowledge to minimum and explore the place realistically than virtually. After some extensive riding for 2 days we reached Leh the capital of Ladakh passing through the mighty hills, dangerous passes, crossing a number of streams, rivers, roads with mud, black snow and sometimes riding on so called roads. But the ride to Leh-Ladakh is full of picturesque views and serene valleys and raging rivers. It’s a complete journey. Ladakh: It’s a heaven on earth with unparalleled splendid beauty, diverse, distinct, unlike any place of earth. Ladakh is encompassed by mountains in all directions accompanied by grasslands, barren desert and countless streams. Ladakh remains cut off from rest of the country for most part of the year. Ladakh is also known as ‘little Tibet’ because of the cultural similarity which it owes to its proximity to Tibet. 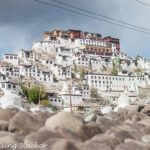 Leh: Leh is the capital of Ladakh but sparsely populated. Leh has some famous Monasteries and largely buddhist population. Shanti Stupa: The beautiful Shanti Stupa was opened by Dalai Lama. Shanti Stupa is the most important attraction in Ladakh. Khardung La: Khardung La is the highest motorable in the world. For every motorist it’s an achievement to drive on this circuit. Pangong Tso: Pangong Tso is the surreal blue water lake stretching from Spangmik to China. Nubra Valley: Scenic vistas, barren deserts, bactrian camels, lush green orchards, Nubra valley has it all to awestruck you with its serenity and grandeur. Magnetic Hill: 27 kms from Ladakh, Magnetic hill attracts a number of tourists for anti nature phenomenon it exhibits. Hemis National Park: Hemis national park is the second largest biodiversity park in South Asia. The national park is home to numerous species of mammals nearing extinction. The park has more than 200 snow white leopards. Near 400 yr old Hemis monastery is also located in this park. Tso Moriri: Tso Moriri is another high altitude lake in Changthang, though less famous than Pangong Tso, it is full of splendid beauty. Zanskar: Zanskar is one of the most unexplored and isolated place in the country. Zanskar is very famous among adventurous enthusiasts. Trekking, Rock climbing, and the white water rafting are very popular here. Quaint old monasteries, raging water bodies, mighty Indus, free fluttering flags and no civilisation in sight, this is what describes Zanskar. It’s a place where you feel at peace with yourself. The 10 days I spent in this barren splendor, snow-clad mountains, mighty passes, ravaging rivers or in short, the heavenly Ladakh, were the most amazing days of my life with each day imprinted in my mind as if it happened yesterday. The bike ride to Ladakh is a must. It’s a place to let go of your inhibitions and explore the unexplored in this pristine, serene, extraordinary, primeval world. It’s rightly said you do return from Ladakh but your soul is left wandering in beautiful passes of Leh-Ladakh which makes you to return to this place again and again. A lot of people helped me in this trip and while there are backpackers who roam around on their own, I think family travellers should opt for an experienced service provider for Ladakh Tourism to have a memorable and hassle-free experience. Till some time back Leh Bike Tour was a place that was ventured only by people who would be ready for heavy adventure and almost no Itinerary, Just days on the Himalayas and it was the primary reason why this tour was mostly done by foreigners. But with more and more information and better infrastructure along with the positive marketing efforts by the governments leh bike tour have become one of most sought after adventure tour among the Indians. “3 Idiots” and recently released “Jab tak hain jaan” with the its protagonists riding and driving across the Leh have only increased the curiosity of the Indian masses.